On Friday night I actually started reading No Plot? No Problem! 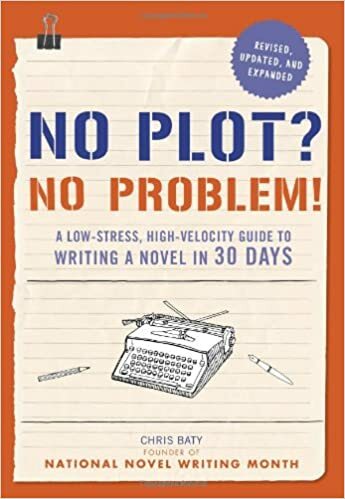 : A Low-Stress, High-Velocity Guide to Writing a Novel in 30 Days. Chris Baty, the author, is the founder of NaNoWriMo and starts off by telling us the history of the project. He wrote about the first year NaNo came into existence and how there were only twenty odd people taking part. Then he went on to tell us what he learned that month and how it sparked his interest in writing a novel…for real. Chris writes No Plot? No Problem! tongue in cheek – but there are some inspiring comments to be found in the book (and I’ve only read the introduction and first chapter so far). One statement that got me thinking was what he said about the most important ingredient in writing. He claims it’s not coffee and it’s definitely not character, plot or setting. The most important ingredient in writing is having a deadline. Without a deadline, we sit back and take it easy. We relax and procrastinate. Why shouldn’t we? There’s plenty of time to get the job done so why not leave it until tomorrow and do something else today – like sleep in, or read, or watch the TV, or play a computer game. We can always write tomorrow. This attitude never allows a writer to finish a project. After several months of working half-heartedly on a story, we get sick and tired of the characters and the setting and start on something fresh. This cycle can be never ending. And this only provides the writer with several half-finished stories and no enthusiasm. However, with a deadline, we will knuckle down and get the job done. Of course, we can set our own deadlines, and for a disciplined writer that works well, but for most of us we know we can change the deadline if “life” throws other issues at us. Although this isn’t a sin, it does mean that projects still don’t get finished because the deadline is self imposed and flexible. But a serious writer who is given a real deadline, that is not flexible, will soon discover that inspiration and the need to produce something submittable will force the writer to lock themselves away from the world and get the job done. Having a solid deadline means we will write everyday until the story is complete, polished and submittable. I agree with this and now I challenge all writers who set goals for themselves to think of those deadlines they give themselves as solid, no excuse acceptable, deadlines.